We just went to Frozen On Ice. What a thrill. 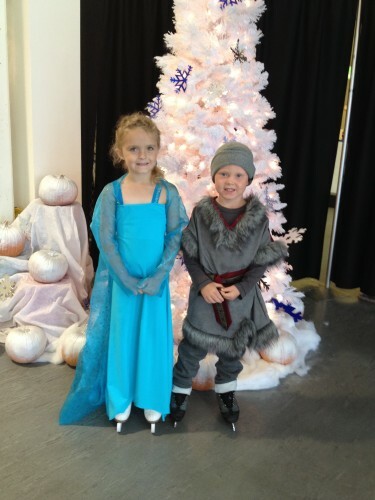 My daughter loves to ice skate and recently tried out for the (Jr) synchronized ice dancing team. She works hard at her lessons and always has a smile plastered on her face. 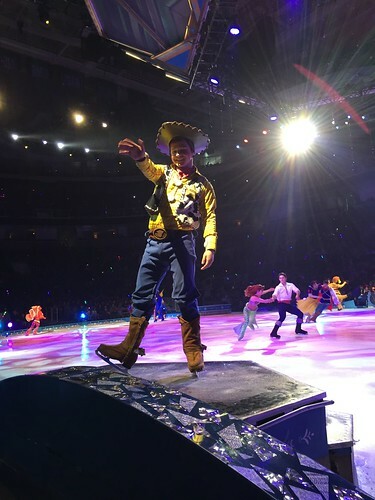 So for us, Disney on Ice is more than just “a show”. 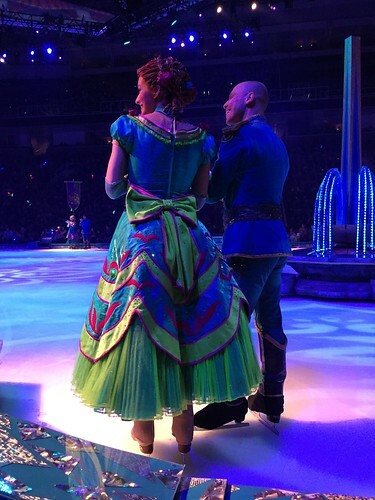 To be at a performance of this caliber and see the skaters close up was just a tremendous experience. 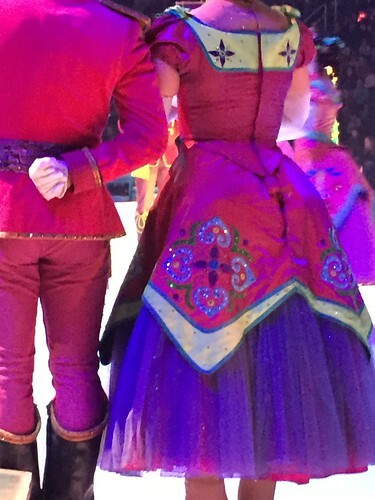 I was dazzled by the intricacy of the costumes. They play to the back top row of an arena, but close up, they do NOT disappoint!!! 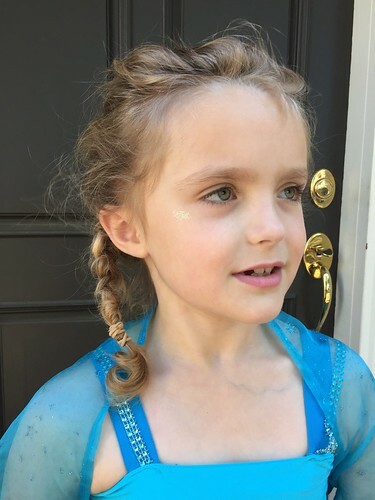 We didn’t wear “make-up” to the show, but right before we walked out the door, I added a little bit of sparkle to Elsa’s cheek – just to represent the frost. Elsa was SO pleased with her dusting of snow sparkle. 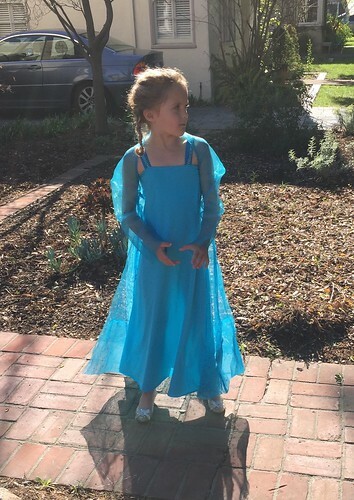 Here is the full effect of the Elsa costume. This has been one of our most popular creations of all time. I first made this dress and “cape”/jacket for her about two years ago. Frozen came out and took the world by STORM. No animated feature had EVER done as well as Frozen did. We went to the Disney story to look at the dresses and there were NONE. There was a time when the Elsa dresses were on Ebay for $600-$800 and selling!!! Of course, the response in our house was just to scoff and go to the fabric store. (I mean, really, we were never destined to buy a costume premade from the store anyway, were we?) When I first made the cape part, it was super long and made a dramatic train behind her. (It was indeed dramatic and successful.) But as time went on, and she wore this costume more, the train feature became a burden and actually bordered on dangerous. Before she wore it ice skating – out on the ice – I modified the cape piece and hemmed it way up. (That modification can be seen in this picture.) I think it looks good still. The bottom line is that it is safe. As she grows, if she still likes it, I can let it down. 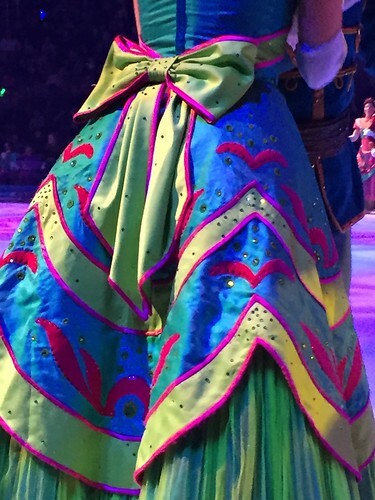 Now, let me share some of the costumes that we saw at the show. Some of the villagers that came to the coronation. There are so many layers of embellishment here. The pipe trim appears to be done by machine, but the little pink “sea gull” shapes look like they were added by hand. And there are so many levels of bedazzling that it is just hard to imagine. I want to take the costume people out for coffee and ask “so? e6000? or gem tack? Do you use tweezers? or the little waxy stick? Do you have “back ups?”” “Do you have fun?” That is a LOT of rhinestones! The hair in the foreground here is my daughters. Just for perspective, that is how close we were. 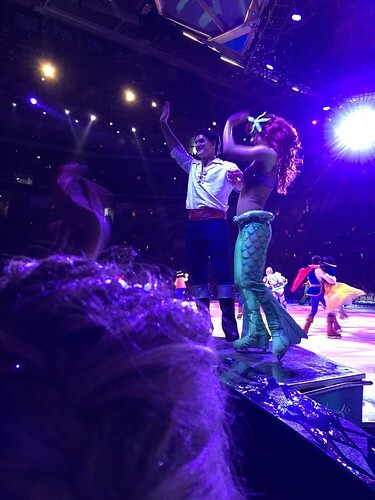 Here Ariel and Eric are waving right to us. 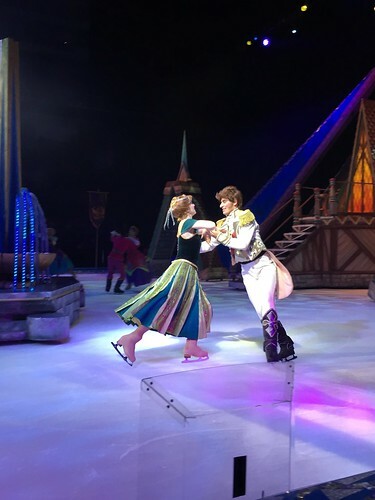 Ariel has her legs to skate with, but her legs are in a fish tail pattern. Her “pants/legs” were also just amazingly detailed. 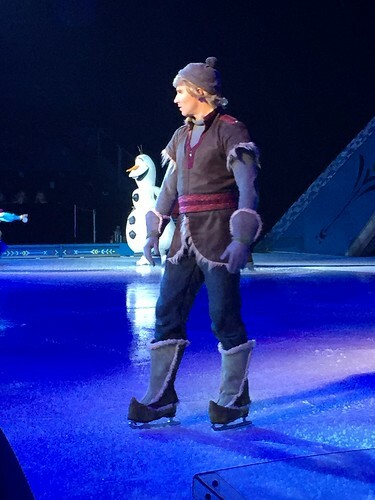 Kristoff has a special place in my heart. Here is the royal couple on the ice back in the day. If the show comes through your town I would highly recommend it. I thought it was fun to see their interpretation of one story on-ice. I liked the “one story” format as opposed to a mix of scenes played from different shows. Have fun! And happy crafting! 3 years ago by Susi in Places We Go | You can follow any responses to this entry through the RSS feed. You can leave a response, or trackback from your own site.